How many times have you said that? Hindsight being twenty/twenty and all that, we end up saying this too many times. And sometimes it is something simple that we can just brush off and mark it in our “never to repeat” experiences. But how destructive this would be when planning a wedding? 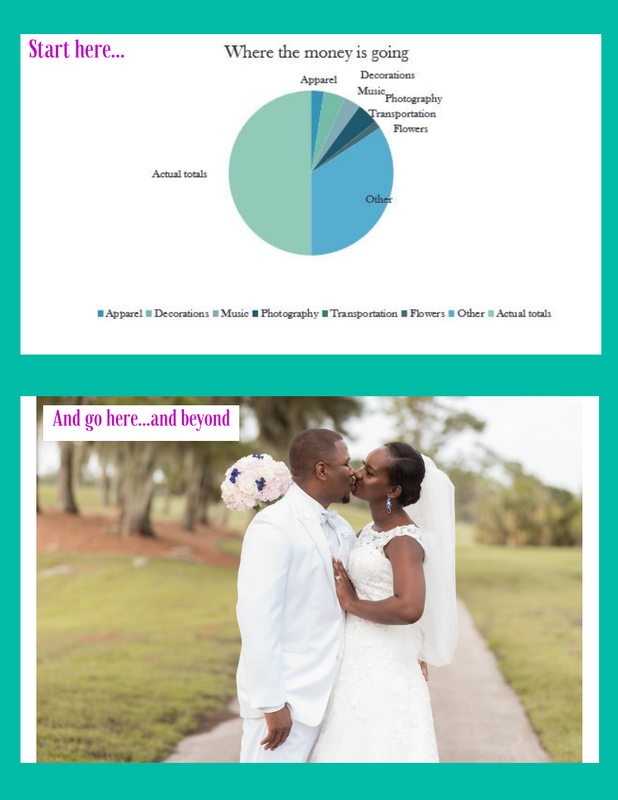 Expounding on last week’s blog about the importance of learning about your financial mindset and creating a budget, we will talk about certain experiences that real brides have had planning their wedding and things that they ended up saying “I regret” about. If you’re wondering how this links with budgeting and finance, stay with me. Here is one that is heard a lot – “I shouldn’t have spent so much on my dress. I only wore it once and now that is money I’m not able to use (insert monthly expense here)”. Think about it. Now, disclaimer. I’m a firm believer of you finding your dream dress that will make a statement. It is your day, why not make several statements? Just consider that if you’re going to splurge on your dress, having a budget is a great visual reminder. What is that reminder saying? If you are going to spend nearly $3,000 on a dress, then you have to cut funding from another category to be able to afford it. Another that brides have said that they regretted is not allocating funds to hire a wedding planner. A lot of times venues provide venue coordinators. Let me be the first to let you know unless they say “wedding coordinator”, expect to only receive help with areas that pertain to the wedding venue. Some venue coordinators are really helpful and do liaise with vendors that will be involved with the wedding. However, (the majority of the time) it is primarily with their preferred vendors (which you could be paying a premium price for). There’s a marked difference between and venue coordinator and a wedding planner or day of wedding coordinator. These brides have said that they regretted not hiring a coordinator because they were not able to enjoy their wedding day, having to manage vendors, contracts and guests. So essentially, they spent most of their wedding day in a blur. A wedding planner or coordinator is there to manage the background chaos that occurs on the wedding day. More like a mediator and personal adviser that navigates you through the day, ensuring that you are present in every moment. This again should be budgeted, because think about it, do you really want to spend your day managing and worrying about everything that can go wrong? Or do you want to be in the moment when you’re pronounced husband and wife so you can be excited about your first kiss as Mr and Mrs? The final regret I’d like to share today is “not setting enough time aside before the wedding for each other”. Planning a wedding is stressful. With help, it can be less so. Although sometimes relationships have been known to be ruined during the wedding planning process. It is very important to set aside time for yourself and your soon to be fiancé before the wedding. This time will allow you to collect your thoughts and have a safe space that does not involve any wedding planning anything. Don’t become caught up in the phase, because the wedding day is only the first stop on the journey to forever. Budgeting is essential here too because if everything is locked into the wedding, where is the “get to grow with each other” time? You used to date each other before the proposal and the talks of marriage. Maybe it wasn’t always the fancy restaurants, maybe sometimes it was an apple pie from McDonalds, or maybe it was ice cream in the park. Budgeting a miscellaneous expense would compensate for the times when you both just need a break from the crazy, and to be able to take the time and just love on each other. Maybe this calls for a weekend where you get away or a stay-cation involving Netflix and some popcorn. Make time for fun with each other. Hope these tidbits encourages you to try to live with no regrets and to set you up for success. Every decision that you make always has a consequence, and that applies to weddings too. There are lots more regrets that various brides have, what advice or thoughts have you come up against that you would like to share?